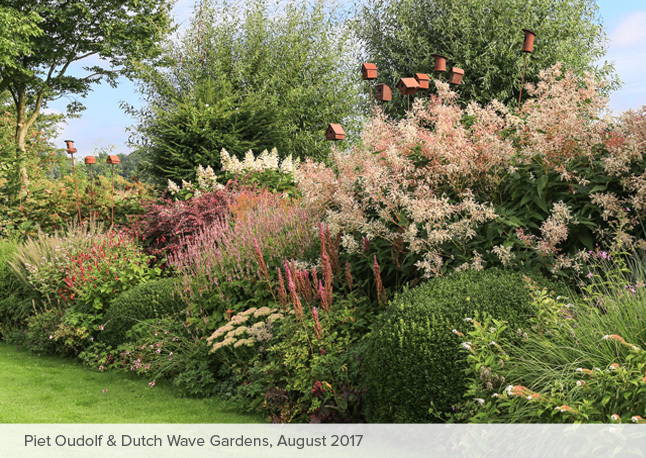 Visit Piet Oudolf’s private garden and explore the bold designs of the influential Dutch Wave designers. Naturalistic planting styles are being enthusiastically embraced by plant lovers and designers from around the world. 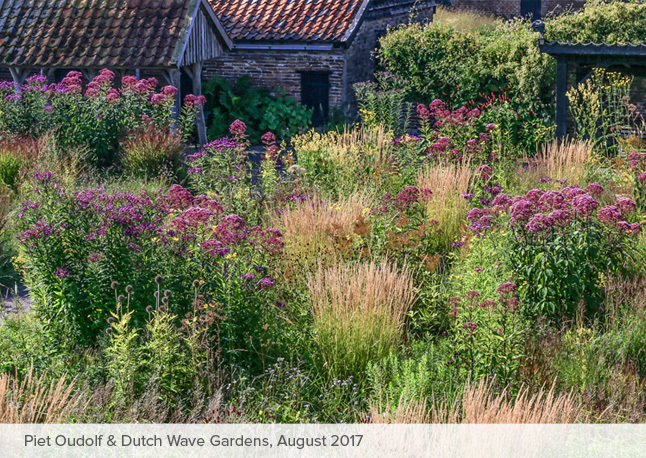 At the forefront of this movement is Dutch plantsman, Piet Oudolf (pronounced Peet Ow-dolf), whose work in private and public gardens is celebrated for its artistry in emulating the freedom and romance of natural habitats. Mr. Oudolf has described his approach this way, “My biggest inspiration is nature. I do not want to copy it but to recreate the emotion.” In this spirit, our travelers can expect to be awed by the gardens we will see on this tour and captivated by the rich history that continues to shape the trend toward naturalism in gardens today. The heritage of this popular style can be traced back directly to Germany and The Netherlands where several figures were working in the early 20th century. German plant breeder Karl Foerster and his pupil Ernst Pagels introduced a new style of gardening with huge drifts of perennials and grasses that required little maintenance. Dutch landscape architect Mien Ruys was a friend of Foerster and she did much to popularize designs using loose groupings of herbaceous perennials that looked like native plants found in natural settings. Mien’s influence was widespread. She inspired Wolfgang Oehme and James van Sweden in the United States, who created the New American Garden style. In The Netherlands, another naturalistic style, that later became known as the Dutch Wave, was adopted by four designers who began collaborating in the early 1980’s. They included Rob Leopold, owner of a wildflower seed company; Ton ter Linden, painter and garden designer; Henk Gerritsen, a designer, writer and plantsman; and Piet Oudolf, the designer who continues to inspire and influence the international gardening world. Tour participants will independently arrange travel to Amsterdam Airport Schiphol and have the opportunity to get settled before the garden tour starts on Wednesday. We’ll gather in the hotel bar to get acquainted at 6:00 PM for Welcome Cocktails. What’s more appropriate than starting our Dutch Wave tour in a town renowned for its use of Dutch wildflowers? Just around the corner from Schiphol Airport is the suburb of Amstelveen with plantings that have been described as “intensified nature.” We’ll visit Jac. P. Thysse Park, named for a biologist who was an ardent devotee of native plants and birds. Designed by the late Christian P. Broerse, the park is home to just about every Dutch habitat imaginable and loaded with wild and semi-wild plantings. The Vlinderhof, or Butterfly Garden, is nestled in Maxima Park in Utrecht, and the garden plan is by acclaimed designer Piet Oudolf. Residents in the area asked Oudolf to design a garden within the park, to be maintained by volunteers. Now, over 15,000 plants are planted in this naturalistic setting attracting not only butterflies, but also many other beneficial insects. Next we visit a relatively new private garden, Tuin “de Villa”. Started in 2004, the garden is located in a polder between meadows and cornfields on land reclaimed from the sea. Here, Fried and Lily Frederix, the owners, have made themselves a contemporary garden. There will be much to enjoy in their crisp, diagonal design that will lead our eyes to the Dutch Wave garden far in the rear. The Frederix’s have turned a pasture into a rich tapestry of texture & color. Grasses move in the breeze and pollinators buzz around flowering shrubs and perennials. If you like to shoot videos, this is the garden for you. We’ll start the day by visiting a private garden designed by Noël van Mierlo. Known for his naturalistic style, van Mierlo is a three-time winner of the National Garden of the Year Award plus the Most Sustainable Garden, Netherlands and the Most Natural Pool. Getting a chance to see a garden by such an accomplished designer is a treat we’ll long remember. Next we travel to Kasteel Geldrop, a 14th century castle, to see the work of planting designer John Schoolmeesters. He came to this garden in 2005 to turn the walled fruit and vegetable garden into a contemporary naturalistic perennial and grass garden. The end result is a prime example of a post Dutch Wave garden with an emphasis on color, texture, and shape. Van Nature is also a post Dutch Wave display garden and nursery started in 2013 by landscaper Frank van der Linden, nursery woman Caroline van Heeswijk, and garden designer Frank Heijligers. Here we’ll see ornamental grasses and perennials that may be difficult to find but have been trialed in the display garden for low maintenance & good habit in all seasons. That’s a tall order but it will be fascinating to see what combinations they recommend. Piet Oudolf’s private garden at Hummelo has become a place of pilgrimage for thousands of followers from around the world. 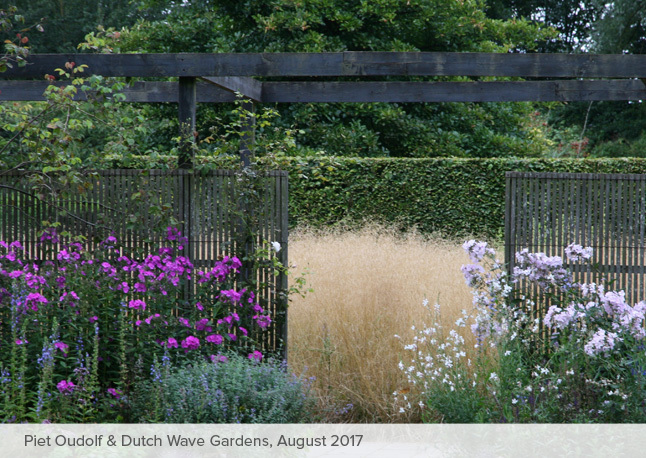 As the master designer of the New Perennials style of naturalistic planting (which, of course, started as Dutch Wave), Oudolf’s garden is a place of experimentation and testing and therefore, constant change. Enclosed by typical Dutch hedges, the interior garden explodes with familiar and new plants in an exuberant, unconventional display. Oudolf has said, “What I try to do is build an image of nature.” Here we’ll see his current image of nature and draw inspiration from Oudolf’s own innovations. This will be a garden experience we’ll never forget. We’ll dip into Germany to see Hortvs, the private garden of designer and author Peter Janke, considered a rising star in the German landscape design world. The design is inspired by the work of British plantswoman, Beth Chatto, with whom Janke studied in England. We’ll see a meadow, a gravel garden, a woodland garden with simple mulched paths, and a wild, abundant herb garden. It’s geometric and organic, a beautiful mixture of classic and modern styles. Today we take a break from Dutch Wave gardens and visit two places that are important to Dutch culture. One is historical and the other is modern. At Het Loo Palace, we’ll see an example of 17th century formal Dutch garden design, heavily influenced by the French – about as far away as one could get from Dutch Wave. The Great Garden in the back of the palace was designed by a nephew of André Le Nôtre and has a symmetrical axial layout with radiating gravel walks, parterres, statuary, and fountains. In the 18th century, the original Baroque garden was destroyed to make way for a landscape park but it was restored for the palace’s 300th anniversary in 1984. There continue to be renovations. Recently the boxwood in the parterres were pulled out due to boxwood blight and replaced with a cultivar of Ilex crenata. The Kröller-Müller Museum is an art museum and sculpture garden set in a national park. We’ll spend some time here at the museum itself, seeing the second-largest collection of paintings by Vincent Van Gogh (after the Van Gogh Museum in Amsterdam) and works by Picasso, Gauguin, Mondrian, and Seurat among many other artists. We’ll also want to see the sculpture garden, which has an equally renowned collection of modern sculptures in a beautiful park setting. Then, if there’s time, we’ll walk along the Ecological Walking Route or perhaps take advantage of the free bikes and cycle around the 75 acre national park. Today our first stop is Cruydt-Hoeck, the seed nursery started by the late Rob Leopold, a specialist in wildflower seeds and one of the founding members of the Dutch Wave movement. Leopold established the nursery in 1978 to preserve the biodiversity of wild plants, bees, butterflies, and other animals, offering seed mixtures for native wildflower plantings and flower meadows. His influence continues today. A connection with Leopold’s work can be made to the much acclaimed landscaping done with seed mixtures at the recent London Olympics site. Since Leopold’s death in 2005, the nursery continues under the leadership of Jasper Helmantel and Jojanneke Bijkerk, designers who are experts in Dutch Wave principles. Our last garden of the day is the important Tuinen Mien Ruys. Here we’ll pay homage to the woman many call the “Mother of Modernism,” landscape architect Mien Ruys (1904-1999). She made these gardens over a period of 70 years and they’re a reflection of her amazing creativity. Her style is distinctly architectural but the plantings are loose and naturalistic. There are 28 gardens in all, incorporating old and new styles while using unusual materials and perennial introductions from her father’s internationally renowned nursery. Above all, Ruys was experimental. Never afraid to try new things, her garden was an inspiration to the founders of Dutch Wave as it has been to designers from all over the world. The theme of today’s first garden could be summarized simply as “Plants, Plants, Plants!” Lianne’s Siergrassen is a well respected Dutch nursery that specializes in Dutch Wave ornamental grasses and perennials. Not only has the owner, Lianne Pot, indulged her passion and brought together a virtual living encyclopedia of grasses, she has also created a demonstration Prairie Style Garden arranged in curving beds with over 12,000 dynamic plants. There’s probably not one moment in the year that this garden isn’t beautiful. The Dutch are known for making some of the finest garden tools in the world so we’re very fortunate that DeWit Garden Tools has invited us to visit their factory and maybe even get a chance to make our own tools. The company was started by Willem de Wit in 1898, and today, the 4th generation of the family is running the forging operation. You’ll note the old-fashioned, top-notch quality, along with innovative designs. We continue our tour at Jakobstuin, a garden that falls somewhere between Oudolf’s current style and Prairie Style. The owner and designer, Jaap de Vries, calls Jakobstuin an “Ode to the Dutch Wave.” In addition to warm season grasses typical of the North American Prairie, de Vries also uses many perennial selections favored in the New Perennial movement and arranges plants in the currently popular matrix pattern. Look carefully and you’ll notice that he pays particular attention to texture, form, and light, which is probably the reason his daily photo posts on Facebook are loved by hundreds of followers. Our final day starts with a drive into Germany where we’ll visit Garten Moorriem, Ute and Albrecht Ziburski’s garden begun in 2006. Starting at the 300 year old house, we’ll see skillful combinations of perennials and grasses that get wilder the farther away from the house they are. We’ll cross a garden bridge to see the final plantings that come into their full glory in late summer against the backdrop of a wide, native meadow landscape. This is a garden that plays with the illusion of naturalness to achieve great atmospheric effect. We’ll return to The Netherlands to visit, Kwekerij De Kleine Plantage, a specialty nursery very much in the spirit of the Dutch Wave. In its beautiful display garden, we’ll see the latest in sturdy, textural perennials and grasses planted in alcoves along a crisp, hedge-lined avenue extending from the house. Since everything is labeled, this will be our chance to find out the names of those plants that we’ve been seeing all week but didn’t know. De Kleine Plantage will remain in our memories as a green oasis showing great love for plants and design. The final garden of our tour is Tuin aan het Weeltje, a private garden designed by Piet Oudolf. Large groups of grasses are combined with delicately colored perennials. Here will be our chance to see how Oudolf’s ideas fit into a home garden with typical Dutch landscape elements of water, reed, and ancient willow trees. Maybe we’ll pick up some tips to apply to our own gardens when we get home. Our time together will come to an end but the true garden lover always finds fresh inspiration wherever she is. Travelers can choose to return home or carry on the adventure. We’ll provide coach transfer to the airport at 8:00 AM for those with flights leaving at 11:00 AM or later. Or you can take the train or taxi from Centraal Station to the airport. After a day filled with garden inspiration and botanical discoveries, we will retire to the comfort and convenience of 4 star accommodations. All hotels are thoughtfully appointed and have a first class rating. Rooms are double occupancy with the option for a single room for an additional fee. $4,100 $3,280 per person, double occupancy. +$1000 $800 per person, single occupancy. All 4 star hotel accommodations. All breakfasts, 4 lunches, and 7 dinners. Design and botanical expertise of your CarexTours host. Airfare. This tour is confirmed and you may book your own flights after you have secured your reservation. 3 lunches, 1 dinner, drinks, and snacks. Payment, in full, is due when your reservation is made. By making a reservation for a tour hosted by CarexTours, the participant certifies that he/she does not have any mental, physical, or other condition or disability that would create a hazard for him/herself or other participants. CarexTours and Garden Tours, reserve the right in their sole discretion to accept, decline to accept, or remove any participant on a tour hosted by CarexTours. Cancel May 31, 2017 or before, the refund will be the deposit (or full payment, if that is what you paid as a deposit) less $200 administrative fee. Cancel June 1, 2017 or after, there will be no refund. See “Insurance” item below.